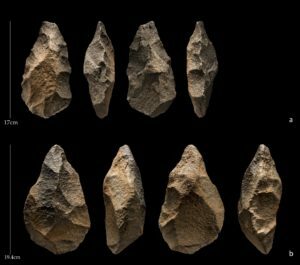 Stone handaxes, similar to those made by early humans as much as 1.5 million years ago, have been dated for the first time in the Arabian Peninsula, to less than 190,000 years old, where their production may have endured until the arrival of Homo sapiens. MAX PLANCK INSTITUTE FOR THE SCIENCE OF HUMAN HISTORY—Beginning more than 1.5 million years ago, early humans made stone handaxes in a style known as the Acheulean – the longest lasting tool-making tradition in prehistory. 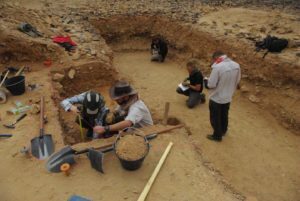 New research led by the Max Planck Institute for the Science of Human History and the Saudi Commission for Tourism and National Heritage has documented an Acheulean presence in the Arabian Peninsula dating to less than 190,000 years ago, revealing that the Arabian Acheulean ended just before or at the same time as the earliest Homo sapiens dispersals into the region. Over 500 stone tools, including handaxes and other artifacts known as cleavers, were recovered from the occupation levels. Some of the stone flakes used to make handaxes were in such fresh condition that they were recovered still resting on the stone nodules from which they had been detached. These and other artifacts show that the early humans responsible for making them were manufacturing stone tools at this site.